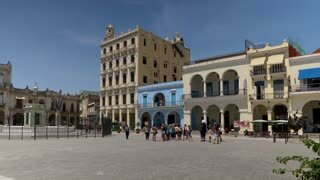 HAVANA, CUBA - Circa July, 2017 - A daytime exterior establishing shot of tourists visiting Havana's Old Town Square (Plaza Vieja). Shot in 5K. 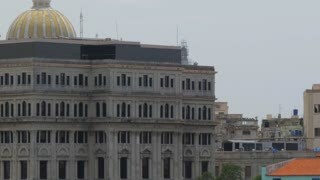 A slowly moving large format dolly establishing wide shot of the Havana, Cuba skyline with the Capitol Dome in the distance. Shot in 5K. 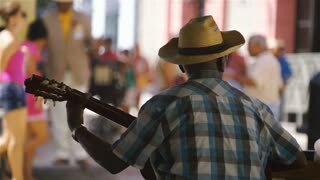 HAVANA, CUBA - Circa July, 2017 - A low angle establishing shot of people in Havana's Old Town Square (Plaza Vieja) on a sunny summer day. Shot in 5K. A high angle dolly establishing shot of the capitol dome in the old town section of Havana, Cuba. Shot in 5K. 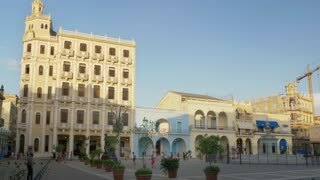 HAVANA, CUBA - Circa July, 2017 - A daytime exterior establishing shot of tourists and locals visiting the Old Town Square (Plaza Vieja) in old town Havana. 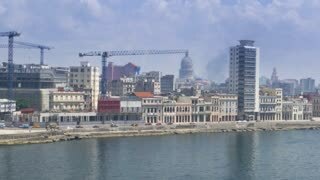 A long dolly establishing shot of the shoreline of Havana, Cuba. The capitol dome can be seen in the distance. A high angle dolly establishing shot of the Havana, Cuba skyline with the capitol dome in the old town section in the distance. A high angle dolly establishing shot of the capitol dome in the old town section of Havana, Cuba.